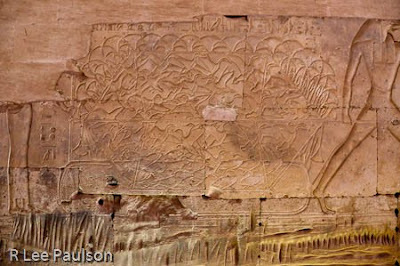 The idea of transition is huge among the reliefs we saw in Egypt. In some of the noble's tombs the inside of which I was unable to photograph, we saw many reliefs showing tasks of the ancient's everyday life. We saw wine making, carpentry and the like in so much perfect detail that scholars now have a really good idea about what every day life was like back then. However, West and Schwaller de Lubicz make the point that those reliefs also symbolize a deeper meaning: The idea of transformation. Taking the 'untamed' world, as it were, and transforming it--both physically and spiritually. Physically turning the grapes into wine, the raw wood into furniture, the raw tablet into one with writing. But also, on a spiritual level, it showed the occupiers of the tombs becoming proficient in perfecting their own mastery of themselves--to a point where they were masters of the raw material (and thereby, the untamed world and, thereby, Set--or, more accurately, the concept of Set) instead of those things mastering them. One has to look closely on this frame to see that the human figure is closing a trap laying on the ground, thereby capturing the birds as they attempt to fly away. We saw this numerous times. We then saw the birds being offered up to the pharaoh or various gods. West says this is yet another form of showing mastery over the untamed aspects of our world, more specifically our inner world. In the ancient Egyptian view, both the taming of the inner world and the outer world went hand in hand. The inner journey, being more important than the external. In our 'modern' ways, it is completely reversed. At a level of pure art, notice how perfectly this flock of birds has been rendered. Whoever did this was a master artist. As a master of his raw material, it's like he (she?) embodied these concepts into the body of the living temple. Yet another level of meaning. We find in this panel here in Abydos something that is quite interesting as well. The ancient Egyptians always maintained that they had had a continuous civilization that went back a very long time, 30,000 some odd years, as a matter of fact. Most current Egyptologists consider such claims exaggerations by the ancients. However, a Greek writer, in a manuscript that still survives, has a list of the ancient Egyptian pharaohs that is quite long, and, if one does the math on the average length of a pharaoh's reign, the longevity of the culture approximates the estimate mentioned above. When we walked out the back door, I saw this fellow (above) standing as a sentry over the ancient temple below him. We were outside for nearly an hour and never saw him move or anyone come over to him. One can maybe tell from the photo just how bright it was out there that day. The level of brown in the sky is also an accurate reflection of the amount of sand and dust in the air. I can't tell you how much I appreciated the lens on my camera during this trip. The last one was the telephoto part of it, this shot is the wide angle. Notice the same camel in the upper left corner of this image. Notice also how high he is above the top of this ancient temple. The ancients, like us, Tore down and rebuilt their temples on the same physical sites. 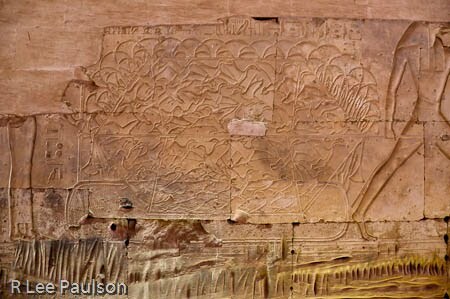 This temple was found out behind and below the back wall of Abydos, which we see just to the right of the camel. There's Mike standing on top of one of the huge red granite blocks of this place. Notice also the water, and the pump in the lower right. Here, Melony has bribed slipped baksheesh to the gate keeper and is walking down the stairs toward what used to be the floor of this place. Notice how she is dwarfed by the scale of the stones. 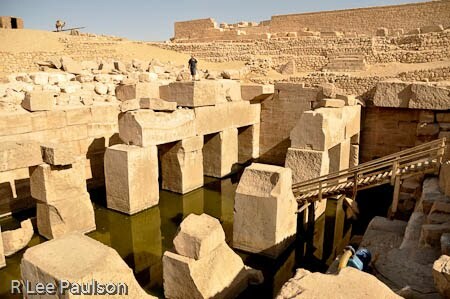 And, how the architecture here is very similar to that of the Sphinx temple we saw earlier. These huge stones have been quarried up in Aswan, approximately 300 miles north and floated down the Nile to get here. Notice how perfectly they are cut and placed. Making this was no small effort. Some of these blocks weigh 100 tons. Replicating this place would tax even modern construction abilities. I am now standing at the top of the same staircase. This place goes on underground for quite a ways. They don't know how far exactly because the water table has risen in recent times and they've been unable to pump the water out fast enough to excavate. 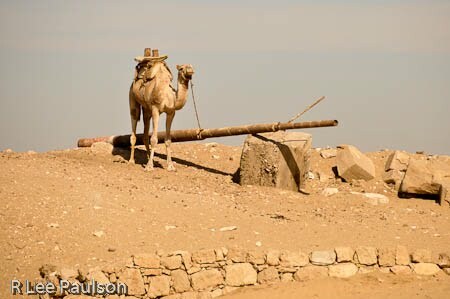 What we can see here is only a small portion of what exists underneath where our friend the camel is standing. 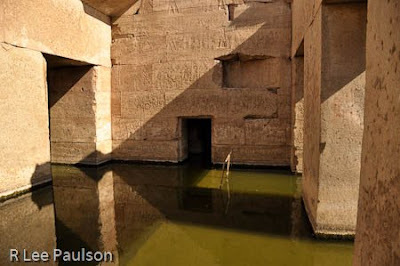 The temple here also extends beneath the existing Abydos temple above. According to ancient legend, this is where Osiris is buried. 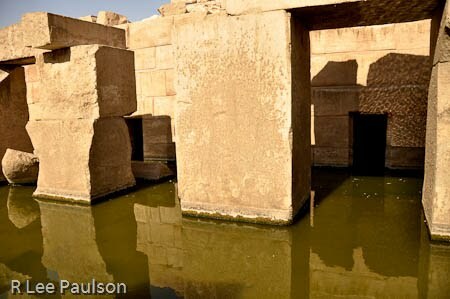 This doorway leads under the existing Abydos temple above. I'm looking right, standing at the bottom of the stairs. There is controversy about this place as well. Current thinking is that this structure is a contemporary with the Abydos temple above. They say Seti built it. 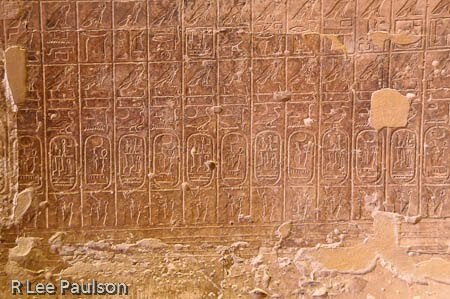 However, West points out the difference in the architectural style between this and the Abydos temple above. As with the Sphinx temple, notice the complete lack of decoration on the stones here. Notice the complete simplicity of the construction, but also the elegance. It's hard to believe the builders of this place were unaware, as the current thinking suggests, of a sense of proportion. 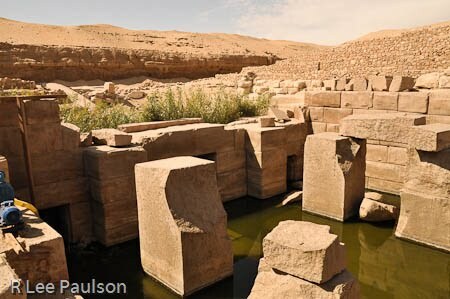 I can tell you that when I stood at the bottom of the stairs, looking forward here, and took a moment to be still and get a sense of the place, that I found myself deeply moved in a similar way as the Sphinx temple. It's like I didn't want to leave. West says this is one of his favorite places in all of Egypt for that reason. Here we are looking left. West makes another very good good point, in my opinion. He said that he believes this place is far older than is currently supposed. He believes this, he says, because we know from our geological studies, that around 10,000 years BCE there was a tremendous amount of flooding in this area. I'm not personally sure of the details, but supposedly, around that time the Nile had some serious floods and deposited a massive amount of silt in this area. West suggests that this temple was built back before those floods occurred, which means that the builders built it at ground level back then. The subsequent floods then buried it to the level of where the camel is standing, and then in the last few hundred years the water table rose and flooded it. Makes sense to me. I can't prove it. 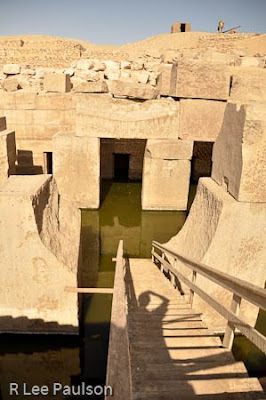 All I can tell you is that, like the Sphinx temple, I had the sense of really old when I stood down at the water level. 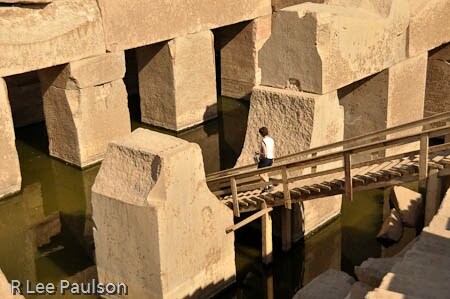 The horizontal line in the ground above the stones on the left they know is Nile silt. The old world and the new collide in unexpected ways. When I climbed to the top of the stairs, walked back up to the existing ground level, and turned around, I saw these apartment buildings immediately behind us. 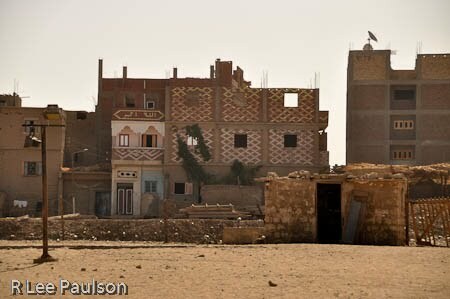 Notice how the buildings are unfinished. Continue on to post 21: Abydos IV by clicking here.